A campsite where there are just a few tents in a luscious meadow, no cars, a breakfast buffet, and a shebeen onsite is a rare thing. Even rarer, it does not involve an overnight ferry crossing, just a two hour crossing from Rosslare to Fishguard (stenaline.ie). From here, a thirty kilometres drive, taxi or indeed cycle, will take you through the gates of Fforest, one of the UK’s coolest campsites. It is just outside the village of Cilgerran, in the heart of Wales’ beach and beauty-filled Pembrokeshire. And it keeps getting better, as all tents and equipment are provided at Fforest. 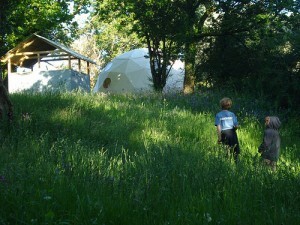 These are no ordinary tents either, with a choice of very funky, cream canvas geodesic dome tents, tipis, bell tents and a more basic tunnel tent, known as the Nomad. All have wood-burning stoves except the Nomad which has, however, like all Fforest’s accommodation, the inspired touch of reindeer hides to keep you toasty, or gorgeous Welsh woollen blankets if skins don’ t do it for you. You need to bring sleeping bags and towels, however, although a double duvet is provided in the dome tent. All tents are positioned on raised wooden bases to keep damp at bay, and adjoining kitchens are covered and fully equipped. Even the shower blocks and loos are beautifully designed using green oak, larch and cedar, and effluent is channelled to a reed bed filtration system. because the kitchen areas are outside, albeit covered from the elements, but in full view of the meadows, moon and stars. Despite the cosiness of the croglofts, I must admit I still pined for canvas, wood burning stoves and fresh air. I got my daily fix of wood-burning in the woodland sauna, which is in a cedar barrel, heated by a wood stove, with a shower round the back for cooling down moments. The kids were delighted as they got to come in too, usually a health and safety no-no in conventional spas. But then most conventional spas don’t have a field full of buttercups to run through afterwards either. The space at Fforest is impressive. There are only a handful of tents in each field, each one strategically positioned for privacy. There are just enough people in each field to be sociable, but you never feel crowded out. Just head to the main wooden lodge for the real social scene, where a delicious breakfast buffet is served every day, with endless pots of good coffee on the go, home made breads, eggs and fresh local produce such as jams and honey. I loved the communal breakfast as it gave everyone a focus for the day, whereas we never seem to get going before about midday on normal campsites. 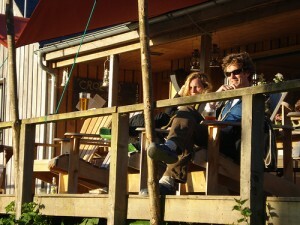 Activities abound at Fforest, although you could easily come here and just do nothing. However, I highly recommend taking the canoe trip down the river as well as the woodland creations sessions, when the boys made pencils out of green hazel wood, freshly cut in the forest, and necklaces out of elder. All those bushcraft things they love and which I get overly neurotic about like lighting fires, sawing wood and playing with penknives. Fforest owners James Lynch and Sian Tucker have pulled off something special here. Although stylish and sustainable, they have avoided the current trend for designed-to-death campsites which kill the very thing we all want from the outdoors. Spontaneity, fun and nature. And plenty of dirt under the fingernails. As a result, the clientele is more green wellies than pink, choosing local cider over chardonnay. What they need now to add to the fun is just a few more Paddies. 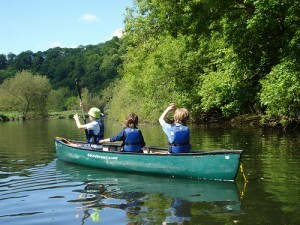 This entry was posted in Articles and tagged camping, ecotourism, glamping, green travel, green travel wales, wales. Bookmark the permalink.